Dorado fly fishing conjures up visions of jungle environments. Including big beautiful fish, leaping and trying to throw a hook! Exotic species like piranhas, packs and pira pitas. In addition monkeys, alligators and exotic birds are your companions. This is all true but also much more. For trout in Patagonia, Andes Drifters is the company that I use. I have found them to be the best operation in that part of Argentina. They also have an operation in Northern Argentina, Parana on the Fly. 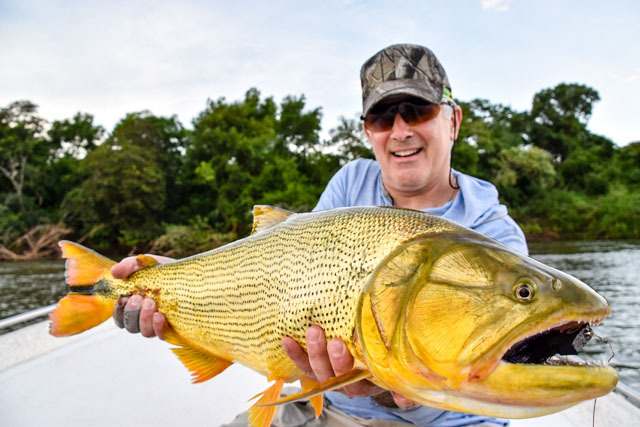 It’s a Dorado operation that has two lodges, Parana on the Fly, Itati and Parana on the Fly, Iberia. 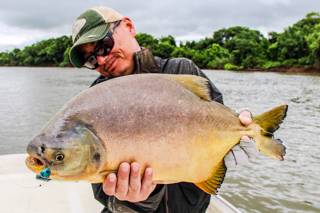 Parana on the Fly, Itati is located in the middle of water that boasts of the largest dorado in the world. The lodge itself is an old estancia that has been rehabilitated. Hence it has all of the creature comforts one would expect at a first-class operation. Private baths, Wi-Fi, air conditioning, bar, satellite TV, tying table etc. Most of all the staff will make every effort for you to have maximum comfort while staying at Parana on the Fly, Itati. The lodging at Iberia is La Alondra, it’s a short 20-minute drive to the dock. This unique and charming property is the result of the transformation of a traditional Argentine home into a beautiful lodge. That is to say the features include: four air-conditioned bedrooms, each with its own bathroom, a dining room, and a common gathering room. It is an excellent place to relax and enjoy a glass of wine after a day of fishing. Meals are chef prepared and offer a nice mix of regional specialties and international cuisine. Laundry service is available for a minor charge. In addition to dorado many other species are available. Pacu, Pira Pita Piranhas, Bogas and others can and will be caught. Reminiscent of saltwater fishing, all species are great fighters. Seems like they all sport significant teeth! Iberia is a new Argentina National Park! The land was donated to Argentina by Doug Tompkins and his wife. Doug, the founder of North Face and Esprit clothing companies, passed away in 2015 but his work continues on through The Conservation Land Trust. He and his wife have donated 2.2 million acres to Chile and Argentina. Andes Drifters has been awarded exclusive access for three boats a day in this untouched preserve. It is almost private fishing! Fishing is much different than on the Parana. Water is clear, you are sight fishing. Average fish size is smaller and so is the water. Consisting of braided moving water it’s completely different than the Parana. To clarify, fish may be smaller but we’ve landed thirty pounders! Equipment used are 7 and 8 weight rods employing floating and intermediate lines. I like the Sonar Intermediate Saltwater and the Amplitude Tropical Titan lines by Scientific Anglers. Straight 40 lb. leaders of various lengths are used and everything is finished with 40-pound steel wire! Flies are provided but I can make some suggestions if you want to bring some of your own. Dry flies, poppers and streamers are employed. To get to Parana on the Fly to dorado fly fish, fly into Buenos Aries. Then connect to Corrientes airport. You will be picked up by a staff member and transported to the lodge you’ve chosen. It’s a 45 minute to 2 hour drive. Finally, the cost for 6 days fishing, 7 nights lodging is $5600 all-inclusive except airfare and gratuities. Hawkins Outfitters is hosting a trip to Patagonia for trout. Starting Dec 2 and going until Dec 12th, ten days of fishing. I will then transfer up to Parana on the Fly, Iberia. This requires that I fly back to Buenos Aries and then to Corrientes. Hawkins Outfitters will host a few days at the lodge. The dates are Dec 12-16, 2019, three days of fishing. Join me there for a dorado experience. We have a total of five spots open, however two are spoken for leaving three left. The cost for three days is $2800 all inclusive except gratuities and airfare. Trout fishing can be added to the trip by either joining us in Patagonia before the dorado portion or by heading down to Patagonia after the dorado experience. Staying at the dorado lodges (one or both) for a week is also an option. I will be there to help you with anything needed. In addition to working on your casting or presentation if needed, we can enjoy a beer at the midday break. A trip to Argentina is on everyone’s bucket list. 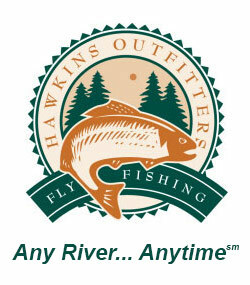 Hawkins Outfitters is the Midwest representative for Andes Drifters and Parana on the Fly. I can help you design a trip that includes one or both of these lodges during a week long stay. Due to my extensive experience in Argentina I will help you with travel, packing and equipment lists. Consequently I will make sure you are prepared for the experience that awaits you. Join us or plan a trip of your own. Let us help!